Otago Museum has many areas that will entertain adults and kids for at least half a day if not a full day. 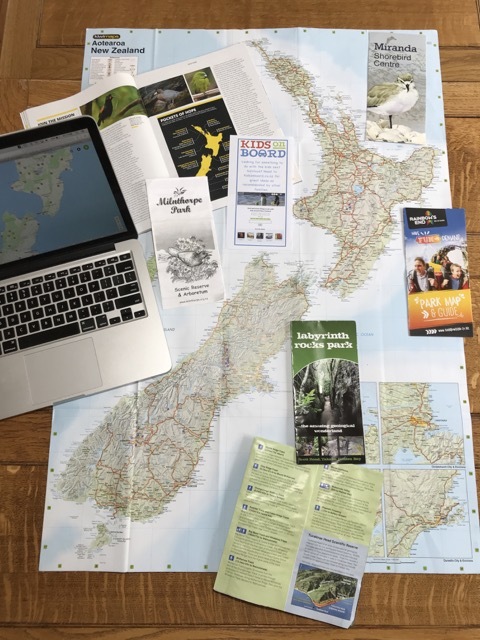 One area that comes highly recommended by locals is the Tuhura Science Centre, home to lots of interactive science displays and experiments, as well as an indoor tropical forest full of butterflies. The forest occupies 3 levels of the museum, complete with indoor waterfall and because it’s tropical, it’s kept warm all year round – a great place to escape to on a chilly Dunedin day! As well as butterflies, there are also giant stick insects, birds and tarantulas (the latter in glass fronted cages) to lookout for! If you’re there at 11am, you will be able to see butterflies that have recently emerged, being released (there’s an extra release at the weekends at 1.30pm). The Science Centre is part of the same paid ticket as the rain forest and kids can learn about lots of different aspects of science while playing. For example, learn about friction by playing air hockey! 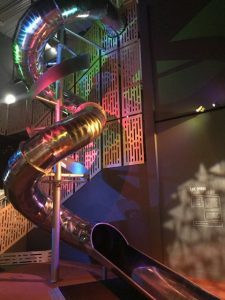 New displays were added in 2017 and have proved to be a hit, like the huge spiral slide (7.6m) inspired by the structure of DNA, that kids can go on. The stop-motion animations and water table are other popular interactive activities. There are members of staff on hand to answer science related questions and regular science shows and experiments during the day. Check the website for times/days. Also new in 2017, the Planetarium is another paid part of Otago Museum (see below for the different entry prices and combo tickets available) and is also loved by some kids. With 4 different daily shows, you should be able to choose something that suits your child(ren)’s interests. From why some dinosaurs started to fly (‘Flying Monsters’); to a guide to the constellations over Otago for that evening (‘The Sky Tonight’); to a look into the chemical reactions that took place to help create everything on earth (‘We Are Stars’); and lastly discovering what lies beyond earth and if there is a chance that aliens exist! (‘Alien Worlds: The Case for Life’). It’s worth noting that the theatre is 360 degrees which while helping to bring the cinema experience to life, might also be scary for some kids. For that reason, your kids need to be 3+ years to watch a show. All shows last approximately 45 minutes. Another area of Otago Museum that your kids might enjoy checking out is the natural history section on the top floor. Known as the ‘Animal Attic’, kids can study bugs, birds, reptiles and other native and non-native animals as they appear behind glass. This area is free to visit. TOP TIPS: It can be a little overwhelming as there’s so much to see and do in the Science Centre, if this is the case for your kids, you can take them out and return after you’ve had a break so long as it’s on the same day. One break option is to take your own snacks or lunch to enjoy in the Attrium on level 1. Because it’s really warm in the Tropical Rainforest, it’s a good idea to leave extra layers outside in the cubby holes provided. If you want to explore the whole rain forest, it might also pay to leave your buggy outside as there are stairs to access the different floors. Science Centre (including the rainforest) Adults $15, Kids (3-18 years) $10, Kids under 3 Free. Family pass (1A+3K) $41 or (2A+2K) $45. Entry to the Perpetual Guardian Planetarium only Adults $10, Kids (3-18 years) $7, Not suitable for Kids under 3. Family pass (1A+3K) $34 or (2A+2K) $31.